Already #BlackLivesMatter protests in Oakland are being likened to the sustained unrest following the videotaped murder of Oscar Grant by cops. But this time something is different. In 2009, a looted Foot Locker flanked by a couple of burning dumpsters in downtown Oakland was described by an eager band of insurrectionaries as a riot, almost as if they were attempting to earn some kind of street cred from their Facebook followers. This time around, well over a thousand people―maybe even two thousand―would leave burning bins strewn for miles down Telegraph Avenue, tagging slogans along the way, and smashing the façades of (and frequently looting) chain stores across the East Bay. 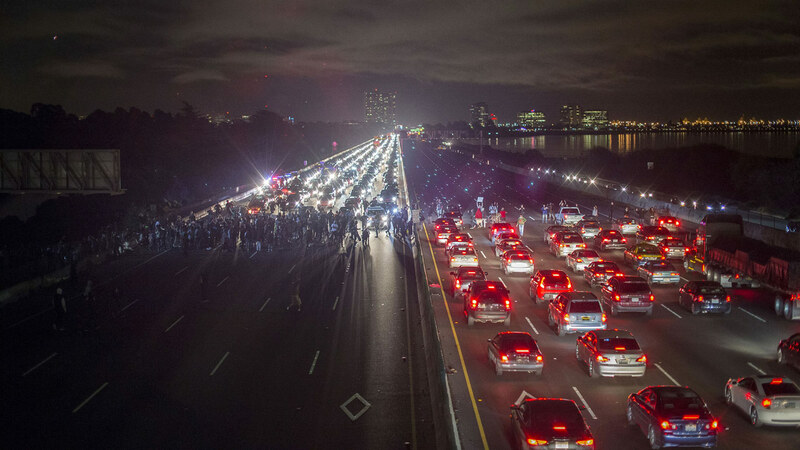 Whereas in the 2009–10 arc of struggle in the East Bay, freeway blockades were notably controversial, they now occur nearly nightly, sometimes three to four times per night, sometimes with thousands, oftentimes with hundreds. During the March 4, 2010, freeway takeover against the privatization of public education in California, even some self-proclaimed radicals were wringing their hands over the loss of potential supporters and condemned the action. At this point, the tactic is so firmly entrenched in the repertoire of mainstream civil disobedience that it has become the de facto standard after the non-indictment of Daniel Pantaleo for choking Eric Garner to death on video. From Cleveland to Detroit to New York to LA, freeway blockades are now the norm. The recent round of East Bay marches began on November 24 following the non-indictment of Darren Wilson for the killing of unarmed black teenager Mike Brown. As fires burned in Ferguson, more than two thousand took to the streets of downtown Oakland, shutting down the 580 freeway for hours and looting a handful of stores in the vicinity. The following night was more of the same, with the 880 and 580 blockaded, and the looting moving into wealthier parts of North Oakland, an area rarely touched by mass marches. A couple of nights later, protesters locked arms through PVC piping through an open BART car at the West Oakland stop, shutting down the transport system for hours. 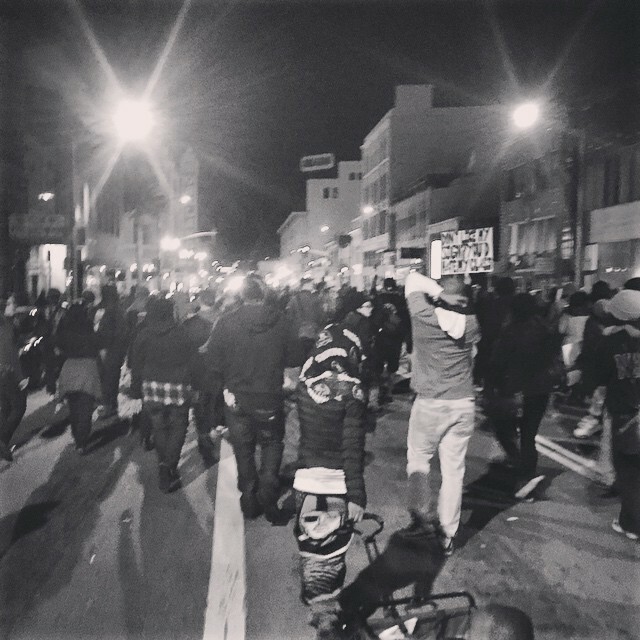 The next few nights were more of the same: 880 blockades, snake marches through Piedmont and eastward to Fruitvale Station where Oscar Grant was murdered, and more window-smashing and looting. By December 5 or so, these actions had become nearly routine, with hundreds standing off against riot police, unsure of what to do next. What was provocative just a few years earlier had now become normalized, with even liberals joining in these nighttime marches. The next night, a call was circulated for a mass march from the major intersection adjacent to the UC Berkeley campus. I didn’t think much of it at the time, assuming things were petering out. How wrong I was. After a standoff outside of the Berkeley PD station on Addison and the looting of a couple of nearby stores (the Trader Joe’s nearly across the street, the Radio Shack on Shattuck), the march made its way back to campus, growing exponentially and picking up students along the way. 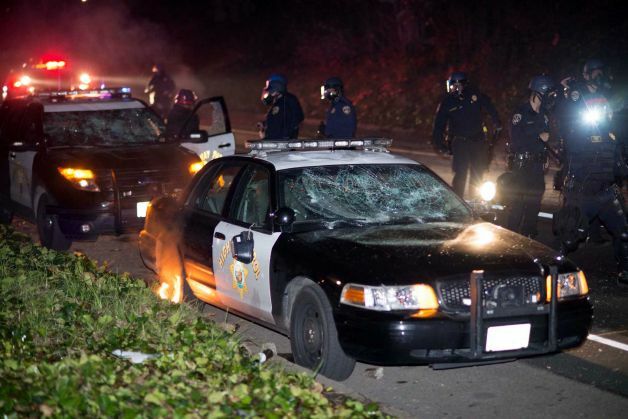 Berkeley PD called for mutual aid, with cops from small strip-mall towns around the Bay, untested in protest situations, deploying overhead baton strikes and firing so much teargas that Telegraph still smelled like mustard in the morning. A couple of photographs showed police repression so incendiary that the following night was one of the most militant marches to date. One photo depicts cops in riot gear raising their batons to strike a black teenager, with onlookers shrieking in disbelief. Another shows countless rows of riot cops on the UC Berkeley campus, appearing far more like an occupying military force than a local police squad. Both were circulated widely on Facebook and Twitter. Thousands gathered on campus that night, attempting to march on the Berkeley PD headquarters yet again, though the police were mutually aided enough that they were able to prevent them from making it inside the fenced-off property. Not to be deterred, the march headed back up to Telegraph and then down Shattuck toward Oakland, culminating at the 24 on-ramp on 51st Street. About half of those gathered sat down in the middle of the intersection, with a sizeable faction of standing marchers urging them to take the ramp. By the time any discussion was had, cops were blocking both on-ramps, though they weren’t as deep as one would expect. Given the previous night’s bad PR, they appeared to be playing it low-key. I was standing by the off-ramp on the southeast side of the intersection. Right in front of me, about a half-dozen younger marchers ran up to a cop car parked on the ramp and began kicking it and smashing out its windows. One jumped onto the roof of the thing and hopped up and down until it caved in. I saw a small explosion — someone later told me it was an M80 firecracker—and the hood began to smoke. I was then shoved to the side as a column of riot police ran through the crowd and nabbed a couple of the kids stomping the car; most got away. By this time, protesters were scaling the ivy, hoisting themselves onto the freeway. A couple hundred or so made their way on and blocked traffic briefly, before subsequently retreating without any arrests. From there, the march snaked back toward Berkeley, where banks and a handful of other stores were looted along the way. At some point the Radio Shack was smashed and looted again, almost with impunity. The cops were certainly keeping their distance, though we heard sirens in the distance. Again, the march headed toward Oakland. I was shocked. The thing started at 5 pm, and it was now nearly 1 am, but the crowd showed no sign of dispersing. Most notoriously, a Whole Foods was looted, with cases of Prosecco distributed to anyone who wanted a bottle. “Garner Protests Marred by Violence, Stolen Champagne,” read a headline the following morning. For all of those claiming that broken windows alienate those on the fence, the next night was even larger. At least a couple thousand marched onto the 80 at the end of University Avenue in Berkeley. I walked along the dark path next to the freeway—not even an on-ramp, but the actual freeway, low enough to the point where one could simply climb on. Hundreds did. The fence had been torn down, and even reluctant members of the crowd joined in. Another group blocked an Amtrak train a few hundred feet away for hours. Marchers on the freeway attempted to take the Bay Bridge but were forced off in Emeryville, where they were eventually kettled behind a Ross clothing store. A hundred-fifty or so were arrested that night, roughly a quarter of the total arrestees over the course of the period between the non-indictment of Wilson and the Millions March. I couldn’t make it out the next night, but as I headed home, I saw columns of teargas a block from my apartment in Oakland. 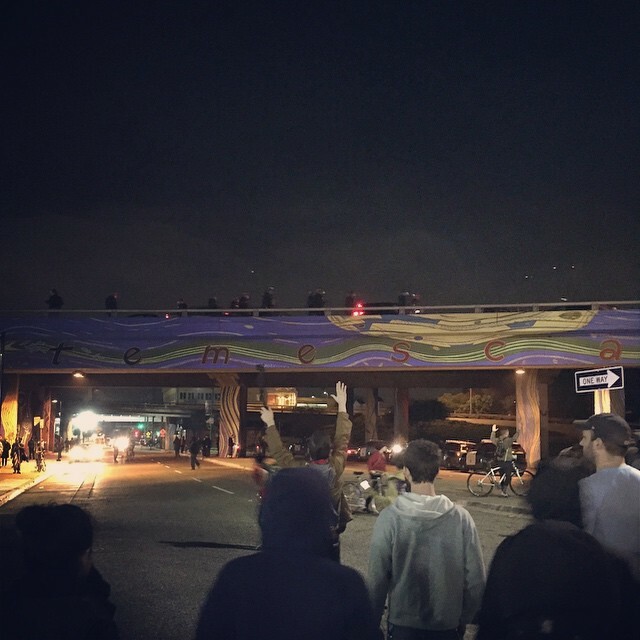 Marchers had taken the 24 again, and California Highway Patrol (CHP) officers were firing rubber bullets and beanbags from overpasses at protesters below. I would later hear about a few chain stores looted in Emeryville. Around 1 am, I walked over to greet a group of kettled marchers on Market. After a few days off, about 6,000 marched on the Alameda County Courthouse, convening on its front steps. This was the Oakland iteration of the Millions March, taking place in cities across the country. That evening, a couple thousand reconvened downtown under a dark overpass. Unlike previous nights, the march didn’t seem to have any particular direction, despite having some of the most militant energy yet. It eventually made its way to a Whole Foods, smashing out the window with customers in the checkout line. Others burned an American flag in the crowded intersection. The march snaked along Lake Merritt, eventually making its way back to Telegraph, right in the middle of downtown Oakland. Shortly thereafter, protesters were kettled and reportedly tasered. I could go on: a couple of high school walkouts in Oakland, a middle school walkout, a brief action by Oakland public defenders. On December 15, a small group of protesters shut down the Oakland PD headquarters, again locking arms through PVC piping. They were also able to remove the cop flag and hoist up a “Black Lives Matter” replacement, with the person responsible remaining at the top of the flagpole for hours. Hundreds of supporters gathered in the rain outside, despite the complete lack of notice and the fact that the action was organized during the workday. While things have since calmed down a bit, calls are out for a noise demo on New Year’s Eve, and more significantly, early January marches downtown on the sixth anniversary of the murder of Oscar Grant. As previous East Bay struggles have demonstrated, from Oscar Grant to anti-austerity movements through Occupy, brief lulls are nothing to fear. The rain and the cold may have tamped things down briefly, but the marches will be back next month. As the Patrolmen’s Benevolent Association does its anti–de Blasio dance in NYC and ramps up repression, even harassing “witnesses” (to what, a brief tussle or an allegedly tossed garbage bin?) in their homes, people in the East Bay are following events closely. With St. Louis in flames again after the murder of yet another unarmed black teenager, this time for pulling a gun that turned out to be a cell phone so that he could videotape the cops about to murder him, the rage hasn’t come anywhere close to dissipating. The months to come will see a revival of the late November and early December uprisings. Lot of detail from within the protests, but wrong about Oakland. Most Black people stayed away from these protests, except for a purely thug element that delights in smashing ordinary folks’ cars and looting shoe stores. After awhile there was Black protest, more organized in separate actions, and more targeted although not enough. For example, they swarmed into a station of the elevated railway (BART) and stopped trains. The great majority of city residents, Black, Latino, Asian, and white, are more disgusted by the broad vandalism they have suffered and by the trashing of the city. They feel revulsion when they see things like this: some demonstrators try to stop meaningless trashing, and the “anarchists” respond by assaulting them. This negative stuff happens in every movement. The problem, at least in Oakland, is that it is the main note sounded. Demands that might broaden, consolidate, and advance things are absent or miniscule.